Our range of gilets & vests continues to grow so we thought we’d help you decide by guiding you through each one so you are fully informed and ready to make your choice. Depending on the time of year and the climate you live in you will be looking at purchasing a gilet/vest primarily to give you that extra bit of protection and warmth without covering your arms. It may be used over your regular out layer or it might just be for those chillier mornings and evenings during spring or autumn when you only have a single later underneath. Gilets and vests are a great year round item to keep stashed away in your bag. 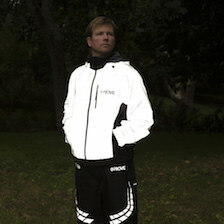 Reflectivity: 100% or reflective trim? What time of year and time of day will you be using your product. If early morning or at night time you may wish to consider a model with the most amount of reflectivity. Cut: The cut or tailoring of a gilet or vest is down to personal preference. If you are purchasing to use on your everyday commute, then a looser commuter fit might be what you are looking for, but for the performance cyclist then a tighter fitting jacket might well be the answer. It is all down to personal preference and what you feel comfortable in. The REFLECT360 range of gilets and vests has grown extensively over recent years since the original version was introduced in Autumn 2014. The popularity across the world has meant we have continued to innovate to give our customers more options and we now offer different colours and styles to match what you are looking for. The stand-out feature of the REFLECT360 range is that it utilises millions of reflective beads embedded in the material to light up to appear bright white using retro-reflectivity whenever headlights from a vehicle hits the material. This in turn helps the driver identify your position on the road further in advance. We have summarised each jacket in the REFLECT360 range starting with the original jacket launched, and finishing with the very latest REFLECT360 CRS+ gilet, and we also have a running option too! This is the original gilet in the Reflect360 range, and it is still as popular as ever. 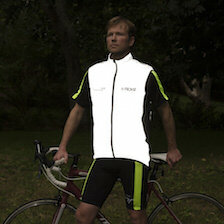 As with all products in the range,it is made 100% from reflective material. By day it is an understated grey colour and by night every inch is reflective. The gilet has a relaxed fit and is a perfect option to use over the top your chosen cycling gear. Features: Side pockets, perforated back, windproof, micro-fleece collar. The Reflect360+ cycling gilet gives exactly the same unrivalled benefits as the original Reflect360 Cycling gilet above but has the added benefit of increased breathability (10,000/24hr) along with a slightly more tailored fit. 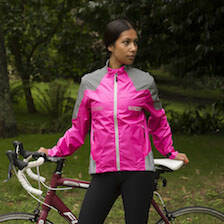 Features: Breathability (10,000/24hr), more tailored fit, side pockets, windproof, micro-fleece collar. The latest model in the REFLECT360 range; the Reflect360 CRS+ gives you exactly the same features as 2) Reflect360+ cycling gilet but gives you the added option of a choice of colours. The Reflect360 Multi purpuse vest is a simplified version of the gilets and it is designed to go over the top of your main cycling apparel to give that extra reflectivity or use for various other activities you may wish to use it for. To complete the range, the Reflect360 running gilet is designed to be a super lightweight shell to help when you are out hitting the roads in the early mornings or evenings. The gilet is made up of a mix of 100% reflective material and a soft-touch and super comfortable close-knit mesh back to help with the breathability and weight of the jacket. This gilet is dual-layered to give great flexibility for day and night riding. On one side, for night riding, it utilises the exact same fabric as the original REFLECT360 gilet to give exceptional reflectivity at night. It also has a yellow or black layer (depending on which colour you buy) that allows you to turn it inside out to give you your day time riding colour. A great 2-in-1 option. When it comes to pushing yourself harder out the roads you may be thinking about softshell which as the name suggests the material is a softer and more flexible material. They offer a bit more warmth as there are more fibres involved, you get good breathability. The PixElite Performance cycling gilet is manufactured from a mix of polyester, elastane and brushed thermal microfibre to give a warm, comfortable and breathable gilet that is suitable for use year round and as an extra layer during peak winter. Fitted shoulders help to ensure a close fit. Designed to give flexibility during autumn/spring when the weather isn’t sure what it is doing. Made from soft-stretch highly breathable (15,000gm/24hr) and waterproof (7,000mm) fabric that gives exceptional comfort. Should you overheat, simply unzip and remove the sleeves at the shoulder. 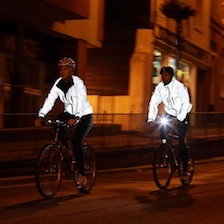 Reflective detail and logos give you a great all round jacket for use in multiple conditions.